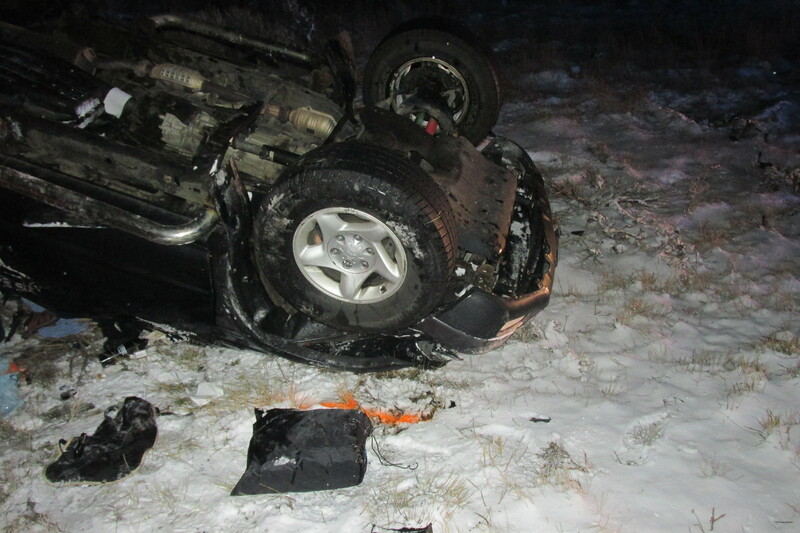 IRON COUNTY — Two Interstate 15 accidents Friday evening — one resulting in death — were caused by the icy road conditions in Iron County brought on by snow and north winds. Both accidents took place less than one hour from each other, Utah Highway Patrol Sgt. Ryan Bauer said, and both trucks were traveling north on I-15 in the outside lane when the accidents occurred. The first involved a jackknifed Silver Ford F-150 and pull trailer at 4:57 p.m. just north of Parowan at milepost 81, he said, explaining that the incident was cleared within an hour and there were no resulting injuries. The second, was a Black Toyota Tacoma that rolled twice, throwing the driver, William J. Wyman, 30 feet from the truck to his death at 5:38 p.m. near milepost 66, Bauer said. 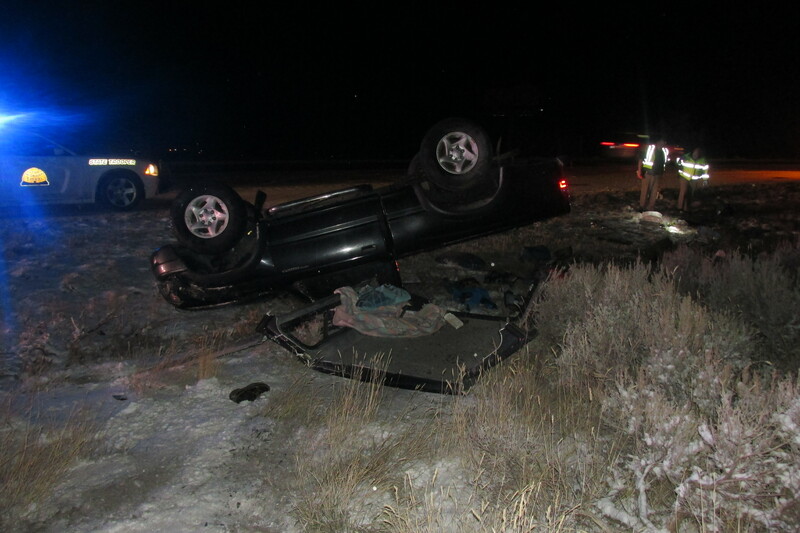 Iron County Sheriff’s Office and Gold Cross Ambulance assisted UHP on the scene. A female passenger in the Tacoma was transported by Gold Cross Ambulance to Cedar City Hospital, formerly known as Valley View Medical Center, with possible broken ribs, Bauer said. The main contributor to both accidents was the icy roads they were traveling on. The couple had been traveling home to Boulder, Colorado, after going away for the holiday together, Bauer said; Wyman was pronounced dead on the scene and taken to Southern Utah Mortuary. Cedar City Hospital has a great program to help people who are going through these kind of traumatic events, Bauer said, and the social worker was visiting with her when they left. Wyman was driving along when he suddenly lost control of the truck on the ice, Bauer said. The Tacoma went to the right and slid for a moment on it’s side, he said, but then rolled twice off the side of the road before settling upside down. Had the driver been wearing a seat belt, Bauer said, it may have changed the outcome of Friday’s accident. The No. 1 piece of advice the UHP sergeant offered for anyone traveling in icy weather conditions like Friday’s is to always wear a seat belt. The No. 2 piece of advice he offered is to slow down. In icy weather it is easy to lose control of a vehicle quickly, he said, so slowing down and driving for the conditions is imperative to preventing a possible accident. Even if a driver is doing all of the right things in icy weather, he said, there is still potential to slide or lose control of the vehicle. If this happens, he said, it is important to resist the urge to overcorrect, because that is when the majority of accidents happen. Most people’s initial reaction is to panic and pull the car in the other direction to correct the slide, he said, but that is one of the worst things they can do and often causes an accident. While letting a vehicle slide may seem counterintuitive, Bauer said, that action combined with letting off of the gas so the vehicle can slow down can make a huge difference. If you lose control of your vehicle, you are driving too fast for conditions. Yes, sometimes 15 MPH is too fast for conditions. There are climatic situations that you as the driver cannot change. You can’t stop the snow or rain from falling, you can’t stop the wind from blowing, and you can’t do anything about black ice. EXCEPT SLOW DOWN, or even get off the road completely and sit it out.